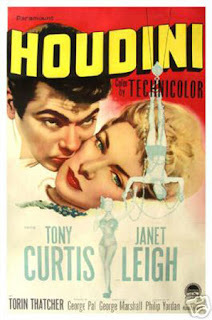 Every Halloween I make sure to watch the one movie that got me interested in magic to start with, HOUDINI starring Tony Curtis & Janet Leigh. It's a highly fictionalized version of his life, but it's a fun movie and for whatever reason gets me re-energized. So in a few minutes, I'll be watching it on DVD. But for those Houdini fans that would like one last dose of the real Houdini before Halloween is over for another year, here is a treat. The Master Mystery starring Houdini! I found it on Youtube and it's broken up into 20 parts, so you can watch it all at once or watch an episode a night if you prefer. Any way you decide to do it, enjoy! Hmm...now you got me thinking I need to watch Houdini as well. You can't go wrong with Tony Curtis/Houdini! Yep - still love it and for much the same reasons.